Google Earth lets you do whole planet image overlays, so you can turn Earth into other planets if you want (see below for other examples). 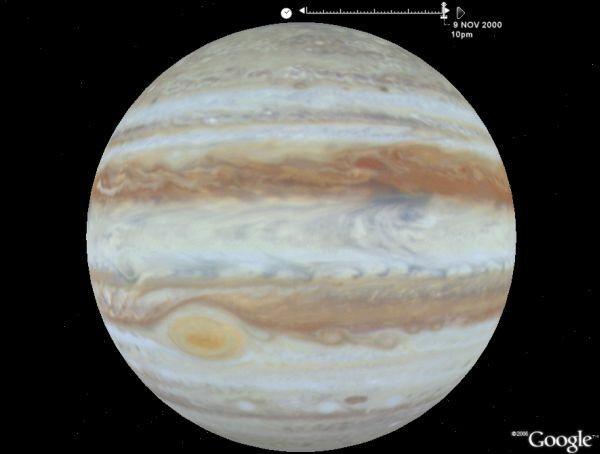 A few days ago, Google Earth Community member 'barnabu' posted a time animation of the planet Jupiter taken by the NASA Cassini spacecraft in the year 2000 over a period of 24 Jovian rotations. The same side of Jupiter is shown in each frame so you see the motion of the clouds. The time animation is viewable in the new Google Earth 4 (v 4.0.2091 or greater). After loading the Jupiter animation (7.1 MBytes), you will see the time slider gadget in the upper part of the screen. First, turn off the Earth's atmosphere by using the menu "View->Atmosphere". You can either move the slider manually, or click on the triangular "Play" on the right side of the gadget. I recommend changing the speed of the animation by clicking on the clock gadget to the left and making the speed faster. The first time through you have to load all the images. After that it should animate quickly if you have a reasonable amount of graphics memory on your computer. The motion of the clouds are really cool, especially the great red spot. For fun, spin GE to while the animation is going. Amazing! See this NASA page for more details on the Jupiter images. Great work as usual 'barnabu'!